Today’s breakfast in the wifi restaurant was a real shock: my laptop refused to start up despite having been charged all night. Had I lost all my Australia images and all Mexico images to date? Rather anxiously I got back to the Hotel, plugged my charger back into the mains and try again – Bingo!!! I quickly backed up all the files that I had worried about to my plug in HD drive. Great! 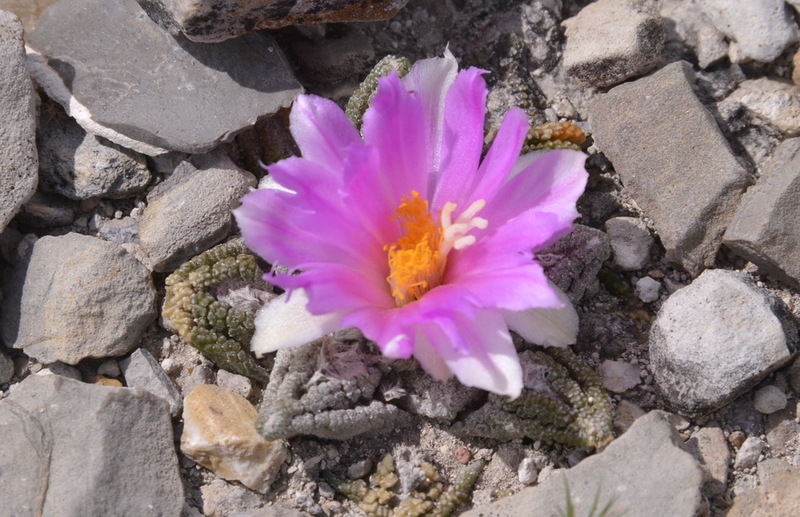 I was also worried that the data for future stops during the trip would be inaccessible, so quickly wrote down coordinates for a stop I had made with Eunice in 2011 and where after some searching we found Ariocarpus bravoanus, or was it subsp. hintonii? (PS. yes it was) Without Internet access I can’t get to the relevant data in Google Earth. A task for the days back in England. Not only did we find it again, but not at the exact spot, but in the same area and Ian found it some 500 m farther along as well all recorded as S3170. From this site I saw and recognised the large white cross on the hill at El Herrero, where again in 2011, Eunice and I went to have a look for Ariocarpus and Turbinicarpus, but where on that occasion a group of Mexican young man started following her as she searched for the plants. This time (S3171) we were not bothered by any of the local people and therefore found the plants (Ariocarpus bravoanus subsp. hintonii and A. retusus ‘horachecki’, in flower and a Turbinicarpus reported as T. frailiana by previous visitors. A good stop with excellent spots by Ian and Cliff. Alain spotted the A. bravoanus subsp hintonii plants in flower – what did he have for breakfast? For S3172 we drove 84 km south of Matehuila to El Huizache, the famous road junction often visited by Charlie Glass and Bob Foster. Again, Ariocarpus retusus were in flower – the best being a plant with eight flowers! All the other cacti were as in March, but not in flower. Again, we had a great day! Another great diary, with nice photos! Sorry i have to correct you here. The Ariocarpus shown on this picture and the locality does not match. El Herrero is the site for A. bravoanus ssp. hintonii, as you can see it on the picture. Keep up the great work!!! Thank you, Zoltan, you are quite right. The Diaries are mostly written ‘live’ in the field and when I get home, any errors spotted are corrected – this one slipped through the net.